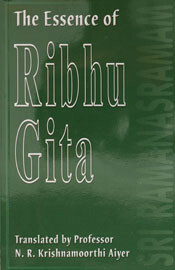 The Essence of Ribhu Gita forms the sixth section of the Sanskrit work known as Siva Rahasya. It is the teachings of Lord Siva in Mount Kailas to His devotee Ribhu, from whom the Gita derives its name. The ebook presented herewith consists of 122 verses from the original Tamil work, being a free translation into English prose, conveying the essence of the original, rather than a mere mechanical word for word translation. The Sanskrit work known as Siva Rahasya. It is the teachings of Lord Siva in Mount Kailas to His devotee Ribhu, from whom the Gita derives its name. Nice to allow downloading of such large collection of holy books of all religions.Grateful for such noble job. Great work. Please do add sanskrit texts also.It shall be very helpful.